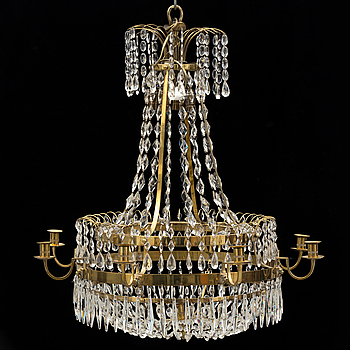 Farm romantic, country style, rustic, Gustavian, antique or modern – no matter what style you have characterizing your home, we have something for everyone in our theme auction ”The new romanticism”. To combine modern design with older and antique furniture contributes to a warm feeling and a personality to your home – the result becomes simply delicate and unique. In this curated theme auction we have gathered carefully selected furniture and objects with focus on craftsmanship and own expressions. Welcome to get inspired of an older furniture world with histories or a provenances. A RUG, old Silk Qum, around 203 x 133 cm. A CARPER, SEMI-ANTIQUE JOSHAGHAN, around 413 x 313 cm. JACOB VAN STRIJ, attributed to. Oil on panel. 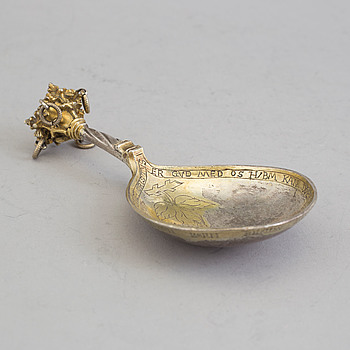 A Nordic parcel-gilt silver spoon dated 1586. UNKNOWN ARTIST, oil on canvas, 19th century. 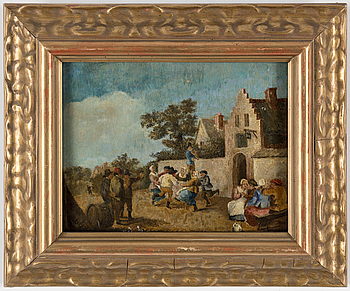 DAVID TENIERS D.Y, in the manner of, oil on panel. 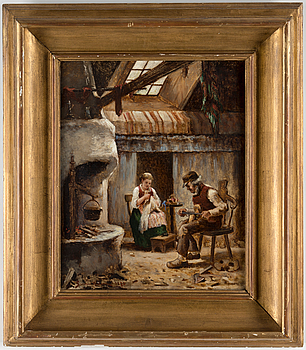 SEVERIN NILSON, oil on canvas, signed and dated 1873. 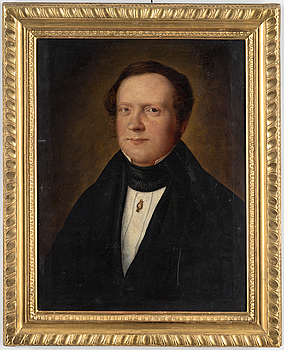 PER EKSTRÖM, oil on canvas, signed. AUGUSTE MUSIN, oil on canvas, signed Auguste Mustin. A late gustavian mirror from around year 1800. A three piece silver coffee set by The Alex Clark Company, London, first half of the 20th century. A Gustavian style chest of drawers, late 19th century. A CARPET, Sarouk-Mir, around 300 x 220 cm. A CARPET, Kashan, signed 432 x 310 cm. JOHAN ERIK HÖGLANDER, six Gustavian chairs, Stockholm, late 18th Century. A pair of Gustavian stools, late 18th Century. A set of ten chairs, early 20th century. A late 19th century painted dining table. A 1882 silver tray by Lars Larsson, Göteborg. A 18th century Baroque gateleg table. A CARPET, Kashan, around 425 x 300 cm. A SET OF 128 PIECES SILVER CUTLERY, "Rosenholm", GAB, 1960s. A CARPET, Yazd. Around 340 x 242 cm. A CARPET, Kashan, around 415 x 313 cm. A CARPET, Kashan, signed Satar. Ca 411 x 289 cm. A pair of silver candlesticks, The Alexander Clark Manufacturing Company, Sheffield, England, 1905. Two pairs of porcelain candlesticks by Royal Copenhagen, Denmark, third quarter of the 20th century. HENRI LINGUET, attributed to, oil on canvas. ITALIAN SHOOL, 17th Century, oil on canvas/panel. A neo renaissance chifonnier from the late 1800's. A 3 part silver coffee service dated 1919. An early 19th century mantle clock, signed Gustaf Undén. A set of four late Gustavian Lindome chairs from around year 1800. 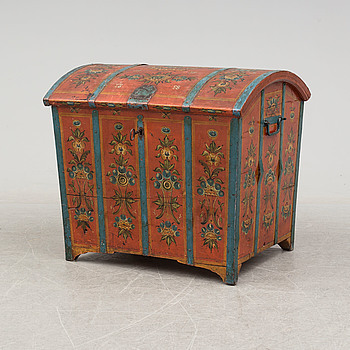 A painted pine chest from Dalsbo, Hälsingland, dated 1866. A Russian caraffe with silver mounts marked i cyrillic V Gordon, Early 20th century. A 20th century rococo style display cabinet. An early 20th century cigar cutter made of a wildboars tusk with silvermountings. A pair of late Gustavian chairs by Johan Hammarström (Stockholm 1794-1812). A gilt bronze Empire mantle clock from Joubert & Beaunis, Paris, France, first half of the 19th Century. A 18th century baroque cabinet. FOUR WINE GLASSES, late 18th century. A rococo style 4 part silver coffee service dated 1954. An 18th century longcase clock. A Parrafin lamp by Skultuna Bruk. A pair of blue and white jars, China, Qing dynasty, 19th Century. A mahogany chest of drawers, 19th Century. A dining table and 12 chairs, second half of the 20th century. A 3 part Russian silver coffee service dated St.Petersburg 1881. A runner from Kashan, around 500 x 93 cm. A 18th century pinewood table. A late 19th century dining table. A pair of late 18th century Louis XVI bronze candlesticks, France. A CUPBOARD, late baroque-style, 20th century. an early 20th century mahogany cabinet/wardrobe. A famille verte dish, Qing dynasty, Kangxi (1662-1722). A mahogany table, Chippendale-style, England, 19th century. 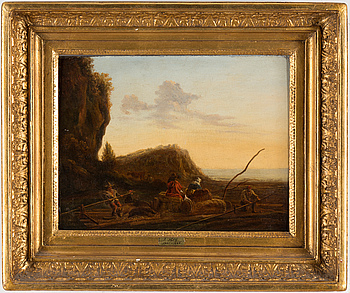 ADRIAEN BROUWER, circle of, oil on panel. 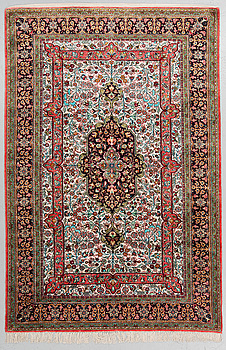 A CARPET, oriental, signed, 230 x 140 cm. A painted pine sideboard, 19th Century. A first half of the 19th century mirror and consol table. 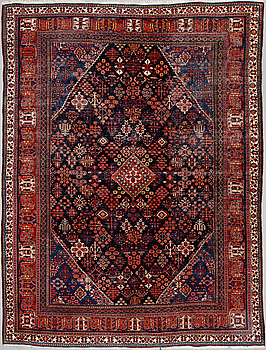 SEMI-ANTIQUE BAKHTIARI, AROUND 214 x 150 cm. TWO WINE GLASSES, probably Italy, 18th century. A "Meunier" two light mirror by IKEA, late 20th century. A first half of the 20th century console table. A swedish biedermeier chest of drawers. First half of the 19th century. A late baroque mirror, mid 18th century. A CARPET, Kashan, around 412 x 292 cm. A swedish empire mirror and console table. First half of the 19th century. A late gustavian table clock, signed Beurling, Stockholm. Late 18th / early 19th century. A pair of Gustavian style wall sconces from the second half of the 20th century. A rococo secretaire in Gustaf Foltierns art, second half of the 18th century. A SILVER TEAPOT LAMBERT COVENTRY St. 1860-1- London. Twelve end of the 199th century chairs. DAVID WRETLING, a bronze sculpture, signed and numbered 13/15. A wood frame with decorations of oak leaves. Circa 1900. 12+2 model 695 chairs by Josef Frank for Firma Svenskt Tenn.
A late Empire gilt metal and glass chandelier, mid 19th Century. An early 20th century cabinet. A three-piece silver coffee service, mid 20th Century. A Josef Frank pair of mahogany armchairs for Svenskt Tenn, model 695. A three-piece silver coffee service from Borel & Co, Germany, mid 20th Century. Twelve end of the 19th century chairs. A carpet Ziegler design, ca 240 x 177 cm. A late 19th century French brass mantle clock. A second half of the 20th cnentury 'Diplomat' coffee table by Josef Frank for Firma Svenskt Tenn.
A pair of table lamps by Björn Wiinblad dated 1987. JOHAN KROUTHÉN, oil on canvas, signed and dated 1916. A first half of the 20th century pair of silver candelabras. 94 pcs of silver flatware, model 'Svensk spets', including GAB, 1910s. An old silk signed Ghom carpet ca 199 x 129 cm.